I wanted a breakfast that would power my morning and would be naturally sweetened. Although I do love my sweets, I'm taking a mini-break from them, so I was interested in a breakfast that could be sweetened with fruit rather than sugar or maple syrup or something like that. This granola couples the nutrition power of whole grains, hemp seeds and pumpkin seeds with sweetness from dates and apple juice. Most important, though, it tastes great, it fills your belly and it has a nice crunch. I like it with some non-dairy milk, but you could sprinkle it on yogurt or applesauce or eat it straight off the baking sheet. 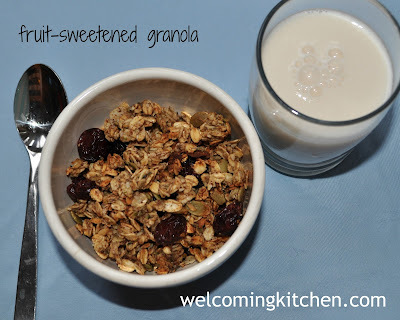 How do you enjoy granola? I shared this with Allergy-free Wednesdays, Gluten-free Fridays, Wellness Weekend and Slightly Indulgent Tuesdays. Combine oats, seeds, apple juice, date paste, coconut oil and cinnamon. Bake 15-20 minutes, or until golden brown. When cool, combine with raisins. What a great idea! I will definitely try this. Thanks, Kathryn! It's nice to have alternative sweeteners available.